As you may know, earlier this year, I attended Families in Global Transition (FIGT) conference in The Hague. I absolutely loved the conference. It was such an inspiring and motivating place to be. I got to meet so many amazing people who support and help expats. I got to chat to so many other expats from around the world with hugely diverse stories. It made me feel right at home (ah, the irony!). I also felt different. My family was never "sent" on an expat assignment. We do not move every two or three years. We never had a relocation consultant or even any moving expenses paid. So, it got me thinking and looking into the different types of expats out there. Being an expat is NOT just about the big package, fortunately. Of course, many of the issues encountered by all expats are similar (culture shock, finding a moving company, making new friends, etc). And I am NOT saying that being one type of expat is harder than another. Some challenges are just different. According to the 2017 InterNations Survey, the first reason for moving abroad is career-related (if you add all of the different types of professional moves). This comes as no surprise. InterNations breaks down the expats into different subgroups representing the reasons why people move abroad. What most see as the typical expat (that person sent abroad with their family on a job assignment for 3 years, often repeatedly) is called the "Foreign Assignee". The expat literature is filled with resources for people who move on foreign assignments with substantial financial and/or logistical support from employers. Their assignments are often for a short period of time. They often move every few years. Often (not always), a home base remains. They may keep a house in their home country, for example. While in The Hague, I heard many participants talk about representation and making sure we were all represented at the discussion table. Representation matters. I think we can do better. The career expat needs more representation. So, here is my humble attempt at changing that. The career expat is not sent on an assignment by his company. The career expat looked for a new job or was offered a new job. That job just happened to be abroad. No big deal, they said. Why not! or Let's go for it! In my family's case, we left the U.K. as the situation there was becoming difficult in the aftermath of the economic downturn. New government spending priorities and companies were downsizing. Many people, in my husband's field, were being made redundant. We thought we should leave before being kicked out. Germany was a strong economic power in Europe and this appealed to us. 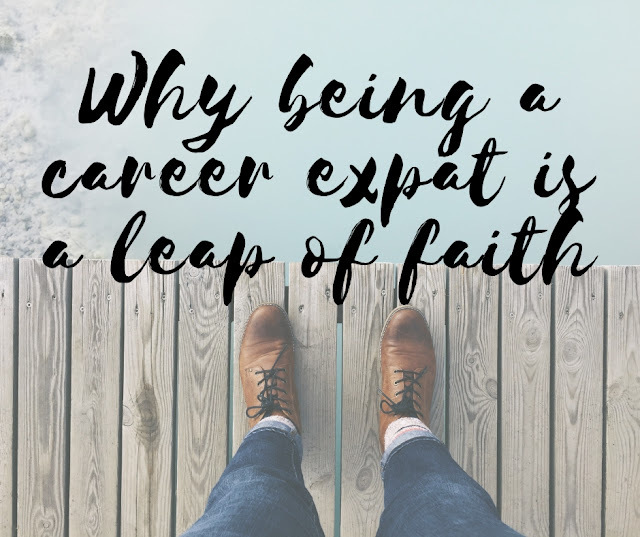 Moving to another country as a career expat feels like a leap of faith because there is no financial help. Some may be lucky to receive a little money towards the move itself. But selling cars, moving home, shipping belongings, setting up a new home can be quite costly. Esther, an adult third culture kid who moved to France from the USA two years ago says: "We moved ourselves, did all the research and weighed the cost of selling vs. shipping our things." It may take time to recover from these expenses financially and many families will find themselves out of pocket for a while. If anything goes wrong for some reason moving back is unlikely to be a possibility. Angela, a South African national who moved from the UK to Germany adds that she had no official logistical help either. "We basically used expat websites and one or two friendly colleagues. As time went on, our german teachers were very helpful." There is nobody to talk your newly-arrived self through the formalities of registering in a new city, country, etc. There is nobody to point you in the direction of the nearest bank, school or doctor for your family. If you are lucky, you find a friendly expat group but all the legwork is down to you. When you do not speak the language, that legwork takes twice as long. There is no point asking a career expat how long they will be in their new country for. Most of them will not have a clue. Flor, a Venezuelan expat, currently in Germany says: "We don’t know.... on one side, we aren’t ready yet to buy a house... but on the other side, we would love for the children to attend university here since it is good quality and almost free. Saving money for three kids colleges hasn’t been easy! I love to travel." Most career expats you ask will give you this kind of answer. Maybe this is due to the lack of financial help, but career expats tend to live more like the locals. In practical terms, this means fewer put their children in international schools. Most of them learn the local language because they need it for daily life but also because they tend to stay longer and need it to feel more at home. Flor explains: "I started volunteering at the school library once a week (even though I didn’t speak one word of German) and I attended a German course where I met some great Turkish ladies. They were my very first friends. Then after 6 or 7 months, when my German language skills were a little bit better, I started making contact with the moms of the friends of my kiddos. I would approach them and introduce myself then invite them for a cup of coffee." Many expats have a home country and/or a company as a safety net. Being a career expat family is a leap of faith without that safety net. Maybe being a career expat is not for people with a plan B. *I am not going into the immigrant versus expat debate on purpose here because, to me, this is a non-issue. We are all immigrants. We are all expats. These are just words. Your skin colour, your religion and your socio-economic status don't matter here. What matters is why and how you are living outside of your passport country. You can call me a career immigrant just as much as a career expat. **Technically, my husband is the career expat here. But we are a team! Very interesting ! I've never heard the word career expat explained quite this way. Kudos for facing every challenge head on and educating others on the same. Very interesting article! I’m like you: a Career Expat or like Yvonne McNulty says, we are self-initiated expats (SIEs), no big package, no relocation privileges but tons of commitment and willpower to make every move count! 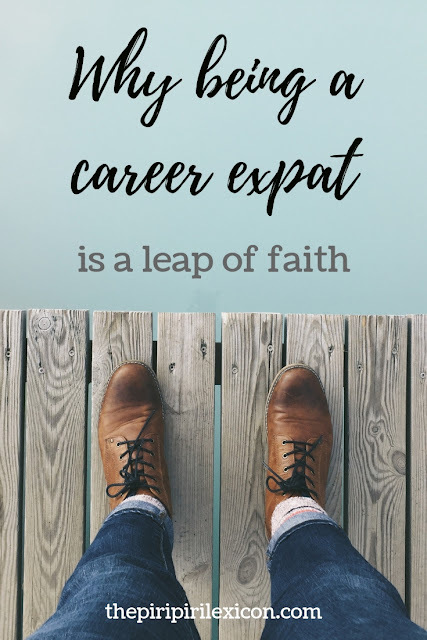 Thank you for introducing/using the term of career expat! I have moved abroad for different reasons: for study, for research, for work (but not sent by a company, so no package, no help whatsoever!) and I'm proud to have managed it all despite or thanks to the lack of the package and the "pampering" (no offense to those who get this service: it's hard enough for many of them to move very short notice and with children etc....). I'm going to share your post – Merci!